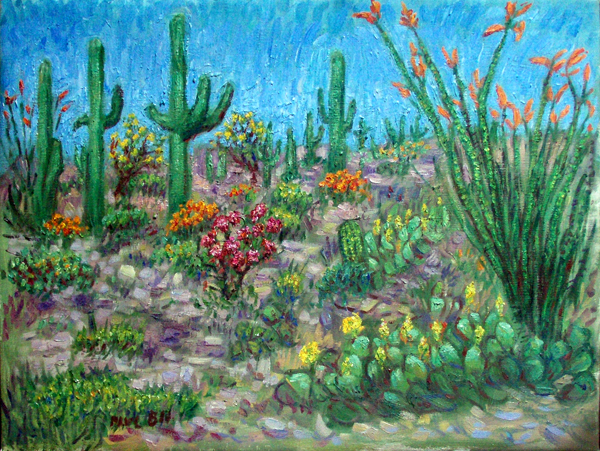 One more painting from my 2011 trip to Saguaro National Park in southern Arizona. This one is sort of a composite of a few photos I took of the various desert flowers that were blooming. This is the last and my favorite of the Sonoran Desert paintings I've done. I really like the orange blooms with the red one in front, and the yellow Prickly Pear in the foreground and taking you back along the big orange one closing off the right side and the yellow bushes between the big cacti in the middle ground. "x 10" matted print on photo pape. Pointillistic/Impressionist Giclee prints of Saguaro National Park on real canvas or heavy watercolor paper are available. One of a kind Saguaro National Parkan embellished prints, which are Giclee prints retouched in genuine oil paint by PaulB. Unless noted PaulB's original Pointillistic/Impressionist oil paintiings are oil on canvas. Paul Berenson's pointillistic/Impressionist oil paintings are in privale collections around the world, including the downtown Los Angeles Athletic Club and have appeared in numerous publications, including the New York Philharmonic Playbill. PaulB.com also builds websites and PaulB is a member of the LA Web Professionals Group.